So, when the ball just won’t go your way, here are 36 quick-fire, mix-and-match golf excuses for any occasion. Just select any combination of the words in brackets, and you’ll have a perfect explanation at the ready! 14. I forgot my [glasses/glove/clubs/spikes/partner/car/name] 15. You were all [breathing/coughing/farting/laughing/thinking/looking] 16. I was still thinking about that last [hole/swing/drink/3-putt/cartgirl visit] 17. The ground is too [dry/wet/cold/warm/hard/uneven/flat/soft/grassy/muddy/clean/grounded] 18. My balls [ahem!] are too [dry/wet/cold/warm/hard/uneven/flat/soft/grassy/muddy/clean/grounded] 19. The greens are too [hard/soft/big/small/fast/slow/bumpy/flat/cored/wet/dry/smooth/green] 20. I thought you said [“dogleg left/dogleg right/uphill/downhill/no water/lay up/fore!/beer/cartgirl”] 21. The [Driving range/putting green] was [faster/slower/warmer/colder/missing] 22. C’mon, where was my trademark [slice/fade/hook/draw/skyball/wormburner/duff/attorney]? And of course, who can forget the age old “unspoken” excuse: Player just frowns at the [club/ball/tee/glove/hat/teebox/rough/shoe/wind/sky/partner] and shakes their head. 2 Responses to "Excuse me? 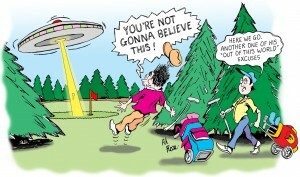 The best excuses for a poor golf shot"
Great selection of excuses. The most common one I hear is the old ‘I have bad back’ or I had no time to practice. Hear these 2 way too often on the golf course.